#BlocLaBordeta belongs to all of us! 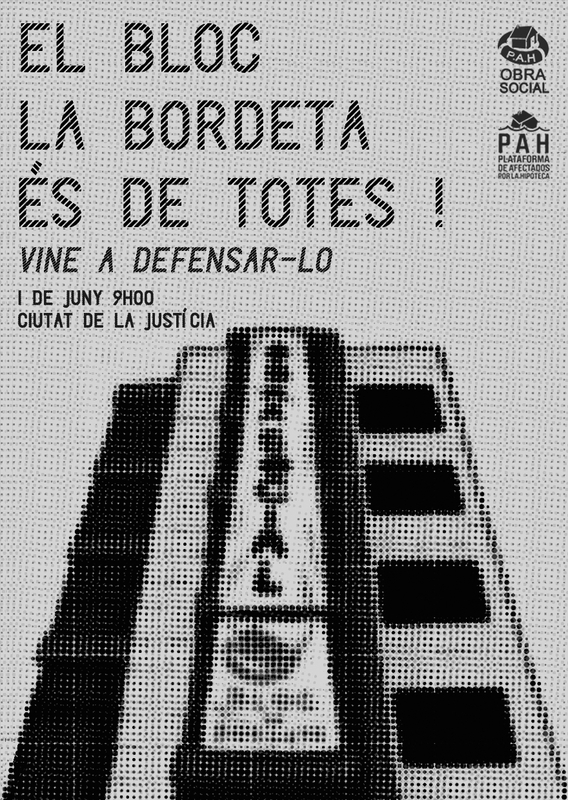 Over 15 months ago, the Platform for Mortgage Affected People (PAH) in Barcelona recuperated the social function of a housing block, the Block La Bordeta, in our neighbourhood, Sants. Next Wednesday, 1 June Spain’s bad bank, the Sareb, is taking us to trial for “usurpation”. The building, in the hands of the Sareb, was never even lived in and stood empty for 8 years. In the framework of the PAH’s Obra Social campaign, the building has become the home of 9 families with no adequate housing alternative. These families have remade their habitat, finding a long sought after stability and calm in the neighbourhood of Sants, a neighbourhood that has a significant deficiency in accessible housing for our neighbours. This past 22 February the Bloc la Bordeta celebrated its first year in the neighbourhood. On this occasion, we released a press release where we manifested our demands and the arguments explaining why we call for this housing block to form part of Barcelona’s public housing stock. Now the PAH has asked for the help of all the collectives in the neighbourhood and in Barcelona to obtain an effective response from the public administrations and the Sareb. The trial is stopped, since negotiations are underway. The building is ceded to the administration and becomes part of the public rental housing stock. The desire of the majority of its current inhabitants to stay in their home and neighbourhood is respected. We are proud to count not only with the strength of our PAH family across Catalonia and Spain, but also with the support of many collectives in our neighbourhood and in our city. We know that fighting together, we will win!